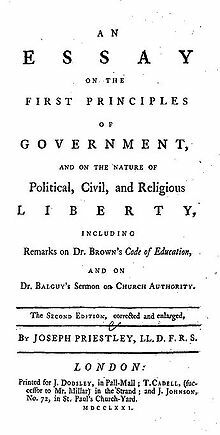 Priestley's friends urged him to publish a work on the injustices borne by religious Dissenters because of the Test and Corporation Acts, a topic to which he had already alluded in his Essay on a Course of Liberal Education for Civil and Active Life (1765). Between 1660 and 1665, Parliament passed a series of laws that restricted the rights of dissenters: they could not hold political office, teach school, serve in the military or attend Oxford and Cambridge unless they ascribed to the thirty-nine Articles of the Church of England. In 1689, a Toleration Act was passed that restored some of these rights, if dissenters subscribed to 36 of the 39 articles (Catholics and Unitarians were excluded), but not all Dissenters were willing to accept this compromise and many refused to conform. Throughout the 18th century Dissenters were persecuted and the laws against them were erratically enforced. Dissenters continually petitioned Parliament to repeal the Test and Corporation Acts, claiming that the laws made them second-class citizens. The situation worsened in 1753 after the passage of Lord Hardwicke's Marriage Act which stipulated that all marriages must be performed by Anglican ministers; some refused to perform Dissenting weddings at all. It must necessarily be understood, therefore, that all people live in society for their mutual advantage; so that the good and happiness of the members, that is the majority of the members of any state, is the great standard by which every thing relating to that state must finally be determined. Priestley acknowledged that revolution was necessary at times but believed that Britain had already had its only necessary revolution in 1688, although his later writings would suggest otherwise. Priestley's later radicalism emerged from his belief that the British government was infringing upon individual freedom. Essay on Government went through three English editions and was translated into Dutch. ^ Garrett, 17; Tapper, 315. ^ Schofield, Vol. 1, 209-10; Jackson, 100-1; Uglow, 169; Kramnick, 20. ^ Qtd. in Gibbs, 40 and Uglow, 169; Tapper, 315. Garrett, Clarke. "Joseph Priestley, the Millennium, and the French Revolution." Journal of the History of Ideas 34.1 (1973): 51–66. Kramnick, Isaac. "Eighteenth-Century Science and Radical Social Theory: The Case of Joseph Priestley's Scientific Liberalism." Journal of British Studies 25 (1986): 1–30. Tapper, Alan. "Joseph Priestley." Dictionary of Literary Biography 252: British Philosophers 1500–1799. Eds. Philip B. Dematteis and Peter S. Fosl. Detroit: Gale Group, 2002. This page was last edited on 8 June 2017, at 11:32 (UTC).